INCIDENCE: At least 8 of every 1000 infants born have some form of heart defect. In India, approximately 1-1.5 lak children are born with some form of heart defect every year. The symptoms vary from mild with a apparently normal child to very severe becoming sick soon after birth. Some of the common pediatric cardiac problems have been listed below to provide a basic introduction to the problems and their treatment. 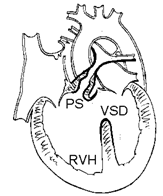 VSD is a hole in the heart between the left and right ventricles (lower chambers). This is the most common heart defect in children. These holes can vary in their size. Babies with large holes develop heart failure, increase in lung pressure, and quite often not grow well. These large holes need early surgery and can be closed with very little risk. Babies with small holes close on their own and rarely require surgery. Location of holes, their size and number determine whether they close spontaneously or require surgery. 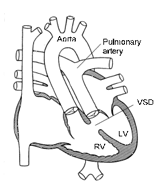 A PDA is an abnormal opening communication (tube) between the aorta and the pulmonary artery. This opening causes too much blood flow to the lungs, and gets the lungs all wet. Kids with a PDA can get winded pretty quickly, and babies with a large PDA may not grow normally. A PDA can be easily ligated by a heart surgeon. Small PDA’s can be closed with a catheter using special devices. 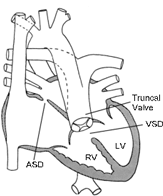 ASD is a hole in the heart, located between the left and right atria (upper chambers). This type of “hole in the heart” can be readily closed by a special device that is placed to plug up the hole or can be closed by a heart surgeon. Not all ASD’s are suitable for device closure and such cases can be closed surgically. Surgery for ASD’s can be performed through a right posterior thoracotomy approach (back of the chest for girls), which gives a cosmetically appearing scar compared to midline sternotomy scar. There are four major defects in TOF. The two defects of importance are the VSD and the narrowing in the pulmonary artery (pulmonay stenosis). The other two are hypertrophy of the right ventricle and over riding of the Aorta. This condition requires surgical repair to fix these abnormalities and is recommonded at 3-4 months of life. In exceptionalcases, a severly blue child or a very scik child , a minor surgery called BT shunt is performed. In TGA, the two great vessels swap their positions with the heart chambers (ventricles), such that the aorta is where the pulmonary artery should be, and the pulmonary artery is where the aorta is. TGV is repaired by “switching” the position of the two great vessels, thereby bringing them to normal position with the chambers and is performed soon after the diagnosis without much waiting. A coarctation is an abnormal narrowing in the main blood vessel of the body, called the aorta. A coarctation can be readily repaired by a surgeon and can be opened with a balloon catheter by a Cardiologist without surgery. Certain types of narrowing of Aorta can be better managed by surgery alone. 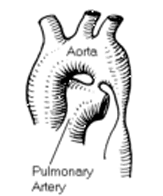 In truncus, the pulmonary arteries come off the aorta instead of the right ventricle. In addition, there’s also a large hole in the heart, called a VSD. 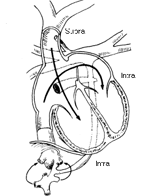 Truncus is repaired by dividing the pulmonary artery off the aorta and connecting it to the right ventricle with a valve conduit. The VSD is also closed to get the circulation back to normal. Stenosis means narrowing and aortic stenosis is narrowing of the aortic valve or narrowing of the aorta directly above (supravalvar) or below (subvalvar) the aortic valve. 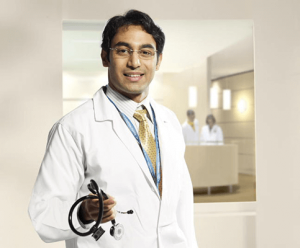 Depending on the severity of the stenosis, surgery is needed to correct the defect. Another option may be a balloon valvuloplasty if the narrowing involves valve alone. 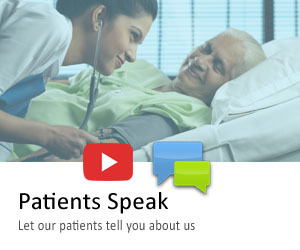 This procedure is done by the cardiologist. PS is a narrowing of the pulmonary valve. Normally the pulmonary valve opens to let the blood flow from the right ventricle to the lungs where the blood gets oxygenated. Because of the narrowing the right ventricle has to work harder to get past the stenotic valve. This can sometimes lead to enlargement of the right ventricle. Depending on the severity of the pulmonary stenosis, open heart surgery may be indicated to correct the defect. Another option is balloon valvuloplasty. This procedure is done in the cardiac catheterization lab. Pulmonary veins normally bring oxygenated blood back from the lungs to the left atrium. In total anomalous pulmonary venous connection all the pulmonary veins drain into the right atrium. Open heart surgery is needed in early infancy. Early open heart surgery is needed for this condition. 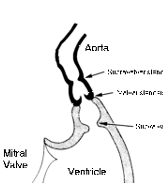 In this condition, there are holes in the upper and lower chambers (ASD and VSD) along with common atrio ventricular valve (instead of two valves – Tricuspid and Mitral). Early surgery is the treatment of choice, where in the surgeon closes both the holes and reconstruct the common valve into two valves (Tricuspid and Mitral).